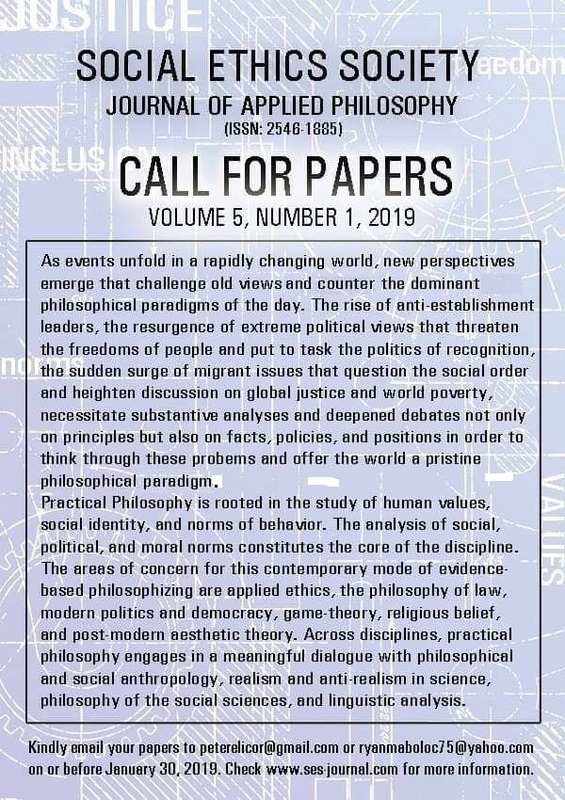 The Social Ethics Society Journal of Applied Philosophy is an open access, interdisciplinary and peer-reviewed journal that reflects on the ethical and practical dimensions of philosophical issues. It is primarily open to local scholars but accepts submissions from international contributors as well. It publishes two issues annually, i.e. April (online only) and October (print and online). The journal provides a platform for philosophical discourse and reflection on social, political, and human development issues. 1. To promote dialogue and intellectual discourse among philosophy scholars, teachers and students. 2. To publish scholarly research on practical ethics and articles of philosophical nature and importance. 3. To develop and sustain a culture of innovative and leading-edge research in applied philosophy and its related fields. Copyright © 2018 Social Ethics Society, Inc.